Grew Up… on a football field. Tony has always devoted himself to football and neglected all other important aspects of life. Profession… head coach of the Miami Sharks. Tony saw the Sharks through their best years and led the team to several championships, though those halcyon days are now over. With a spate of injuries and a losing record, it seems that Tony’s best years are fading into the past. Challenge… getting a handle on his new quarterback. 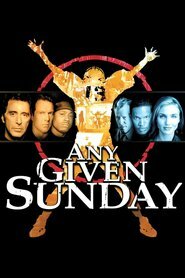 Tony is losing control of his team when the “very, very young and very, very stupid” new quarterback, Willie Beamen, starts to call the shots. It's a clash of generations and philosophies. But it's possible there may be no winners here, only losers, if Tony and Willie can't see each other's perspective. Personality… sage-like and tough. Tony is the wise old coach who can always rattle off an inspiring speech to his men. He tells them, “That’s what a leader’s about: sacrifice. The times he’s gotta sacrifice because he’s gotta lead by example. Not by fear and not by self-pity.” He can still give a rousing pep talk, but is that enough any more? Is the stubborn Tony able to adapt to the changing league and brash young players? Tony D'Amato's popularity ranking on CharacTour is #3554 out of 5,000+ characters. See our top-ranked characters and read their profiles.